According to this year’s annual report from the Commission for Complaints for Telecom-television Services (CCTS) the number of complaints from small businesses dropped dramatically from 841 last year to 494 this year, despite a 57 per cent increase in overall complaints. This year small business complaints to the CCTS about telecom providers and services that violate the Wireless Code made up only 4 per cent of the overall complaints from both individuals and small businesses. Howard Maker, CCTS commissioner told ITBusiness.ca that he cannot account for why this may be. “We don’t have answers as to why the number of complaints dropped. We receive complaints that customers bring to us and [we] don’t know why there has been a drop off from small businesses, particularly when everything else was up,” he says. In comparison, small business telecom complaints to the CCTS reached an all-time high in 2017, with small businesses making up 10 per cent of overall complaints. 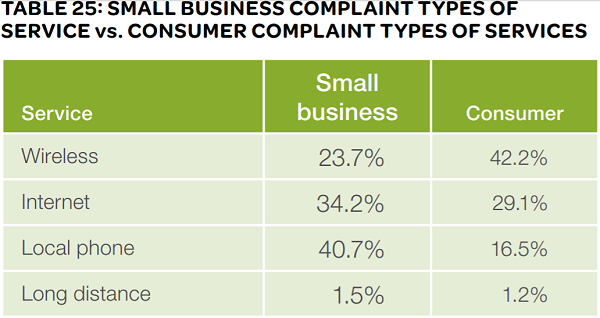 In fact, small business complaints were on the rise year-over-year, steadily increasing from more than seven per cent in 2015, to nine per cent the following year. Despite the sharp decrease in the number of complaints this year, the type remained consistent. Issues with local phones and internet continue to be the most important areas for small businesses. The CCTS accepts telecom complaints from both individuals and small businesses, but the needs of small businesses are clearly different from consumers says Maker. While billing is the number one subject of concern for consumers, more than 56 per cent of small businesses complaints centre around contract disputes (this is consistent with last year’s stats). The top 10 complaints also remained fairly consistent with early cancellation fees still the top of the list by far, followed by misleading information about terms, and inadequate quality of service. In the overall report, that includes individuals and small businesses, Maker points out one red flag, the number of complaints about internet service increasing 170 per cent over the past five years. When asked why the number of small business complaints declined and did not reflect this concern, he speculated that maybe businesses did indeed experience fewer problems, or maybe just too busy to file complaints with the CCTS. But noted its hard to say why the business numbers were so drastically different from the other statistics. This was a record year overall for CCTS complaints, with the 57 per cent increase, in comparison, the previous year only saw an 11 per cent increase. Even with this in mind Maker emphasized the need to make people more aware of the CCTS. “It’s important for small businesses to be informed about the CCTS and the independent work we do designed to resolve disputes that individuals and small businesses can’t fix with their providers,” he told ITBusiness.ca. Companies with a monthly telecom spend of less than $2,500 qualify as a small business under the CCTS guidelines and are able to submit complaints about telecommunications providers if disputes cannot be settled between the company and provider.